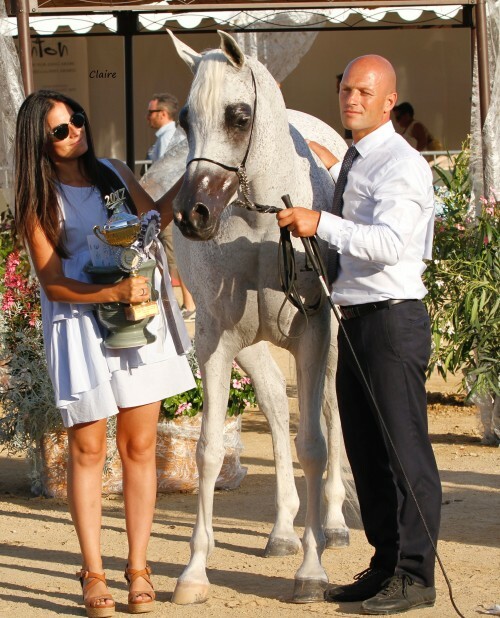 The brightness of the light, the green palm trees, and yellow lemon groves provide a colourful and diverse environment for the Mediterranean and Arab Countries Arabian Horse Championship. Against the multi-coloured backdrop the 2017 dress code - Grey and White - was an elegant understatement. The lineup of champions seemed to follow the dress code: grey and white garnered with some brilliant shades of bay. In the electrifying atmosphere, the energized crowd cheered on their favourite while the team of five judges made their decisions. The quality in the championship classes was impressive and the competition strong; four times the judges time voted unanimously! The opener of the championships was the simply beautiful Sweira Aljassmiya, bred and owned by Aljassimya Farm, Qatar, winning Unanimous Gold Champion Yearling Filly. This bay SMA Magic One daughter was all charm and not only because of her delicate head. Sweira Aljassimya’s dam is Baraka MP by Alfabia Ajib and tracing back to the last daughter of the unforgettable Estopa, Om El Beneera. Om El Beneera is the dam of U.S. Reserve National Champion Junior Stallion and Scottsdale Gold Champion Stallion, Om El Al Azeem. Through SMA Magic One, Sweira Aljassimya offers lines to the strong broodmares Bint Bey Shah and Saskia RJ, so her success is no incidence. Silver went to D Mumayyazah, bred and owned by Dubai Arabian Horse Stud, UAE. A grey filly by FA El Rasheem and out of M Randy by El Sher-Mann. Alsayed Stud, KSA, celebrated Bronze for bay Haifa ED, sired by Kahil Al Shaqab and out of Prestic, who is line bred to Padron. So young yet so famous; the junior fillies championship showed a lineup of superstars and was really exciting. A bay was bested by two amazing greys. Al Thumama Stud’s bay Belladonna AT, by Wadee Al Shaqab, won Bronze. Belladonna AT traces back to Om El Beneera through Om El Belladonna, too. Dapple grey D Ajayeb, by RFI Farid and out of one of the most admired Versace daughters, Ladi Veronika, came to pick up gold like she did before in 2016. This time, the judges preferred another shade of grey but honoured D Ajayeb with Silver. 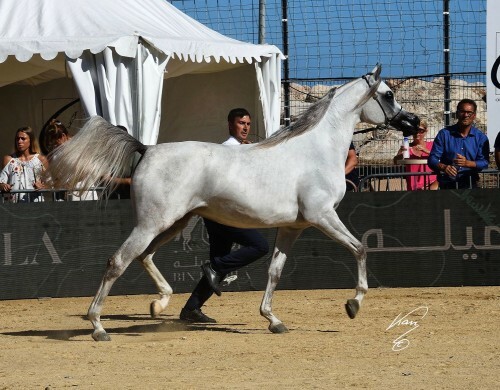 The exquisite alabaster white U.S. National Champion Junior Filly Mozn Albidayer achieved Gold. This filly is another breathtaking product of the Albidayer Stud, UAE, and another successful daughter of young and upcoming sire SMA Magic One. Mozn Albidayer’s dam is Mattaharii by Magnum Chall HVP, making this filly line bred to Padrons Psyche. In tail female line, Mattaharii traces back to the fine Bask daughter Bask Gazal. Both, Mozn’s dam and grand dam were top winning show mares in the USA. It was just logical for Sheikh Mohammed bin Said Al Qasimi to acquired Mattahari as an early yearling. After campaigning her to the title of U.S. National Reserve Champion Yearling Filly Mattahari became a valuable broodmare for Albidayer Stud. Fleabitten Shirin By Aisha achieved Unanimous Gold Champion Senior Mare. Bred by Guriolo Andrea, Italy, this gorgeous WH Justice daughter is proudly owned by Athbah Stud, KSA. Shirin By Aisha is no newcomer to the showring, she was successfully campaigned as a junior, winning Italian Gold Champion Filly twice, Bronze at the All Nations Cup and in Paris, and Silver in Menton in 2012. Shirin’s dam Aisha by Missouri is named after her sire, the Kubinec son Missouri out of well-known Volga. On the bottom line, Shirin By Aisha traces back to fine Polish horses like the Probat son Boryslaw, Abdullah or the Arax daughter Petarda. Alsayed Stud’s Delight’s Diva RB was named Menton Gold Champion Junior Filly in 2015. 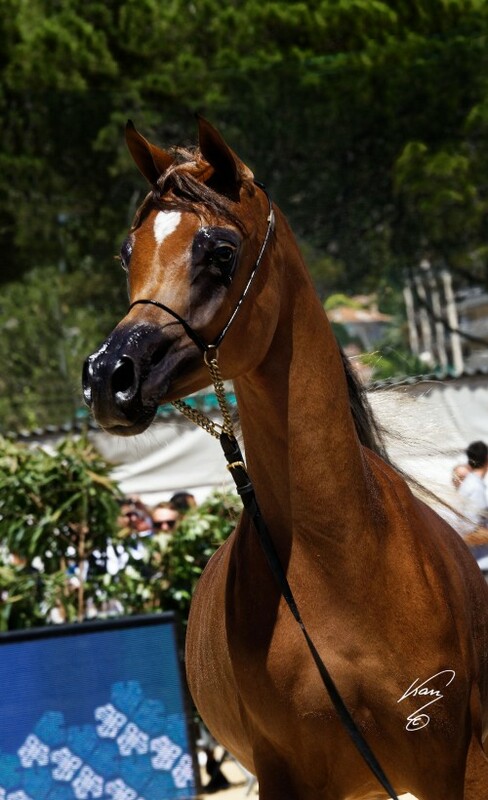 This flashy chestnut, bred by Adriana Espindola de Moura, Brazil, was awarded Silver Champion Senior Mare this time. Sired by Ajman Moniscione, making her a granddaughter of WH Justice, Delight’s Diva RB is out of Honey’s Delight RB by the great JJ Senor Magnum. WH Justice is also the grandsire of Bronze winner Galerida, this time through Shanghai EA. Bred by Michalow, Poland, and proudly owned by Albaydaa Farm, Egypt, Galerida is out of Galilea, who combines the blood of Straight Egyptian Laheeb with Monogramm and traces back in tail female to Gilza - Gastronomia. Nayla Hayek, Switzerland, flew the flag for the European competitors in Menton. Though, she found her Unanimous Gold Champion Yearling Colt HL El Ganador on the other side of the globe - in Chile. Grey HL El Ganador is by HP Shakir Te and out of Lonco Baby Maria, names which maybe are not too familiar to most readers. The Arabian horse community knows Nayla Hayek very well for her famous Hanaya Stud, filled with impeccable Straight Egyptian Arabians. This leads to the conclusion that HL El Ganador has to be out of finest Straight Egyptian bloodlines. Quite the opposite, the colt represents the Bey Shah sire line combined with the influence of Aladdinn, Padron, Ruminaja Ali and El Shaklan. In tail female HL El Ganador traces back to the Halef daughter Koralle out of Kho-Rah from Babolna, who established an influential family in Germany after World War II. Silver winning RD Harenaado, by Hariry Al Shaqab out of DM Endless Romance, was bred by Murray and Shirley Popplewell, USA. Proud owner of the fine chestnut colt is Al Saqran Stud, Kuwait. Bronze went to Al Baydaa Farm’s AJ Mardan son Perseus OS, bred by Gestüt Osterhof, Germany. A bay colt out of Jeunesse OS, a WH Justice granddaughter tracing back to the wonderful ZT Shakfantasy daughter Shak Lavanda. Shanghai EA is the sire of Gold Champion Junior Colt Fuerte, bred by Jan Drzynsko, Poland, and owned by Sami Bin Mohammed Ben Saad. This dapple grey is a real showstopper, winning 2017 Gold Champion Junior Colt at the prestigious Dubai show. Fuerte’s dam is Frymuszka by the wonderful Ekstern out of a Gazal Al Shaqab daughter and tracing back to Fula, Polish National Top Five winner and a reminiscent of her sire, Polish National and European Reserve Champion Stallion Partner. This is the very same dam line of World Champion Mare Fallada. Al Rashediah Stud, Bahrain, competed with a Straight Egyptian colt by influential Al Adeed Al Shaqab and won silver. Naseem Al Rashediah is a grey son out of charming Nabaweyah Ezzain and traces back to the lovely Lutfeia by Alaa El Din. Cyclone OS received bronze. The bay colt is by RFI Farid out of the Ajman Moniscione daughter Inspired Najla, bred and owned by Gestüt Osterhof, Karl-Heinz Stöckle; another European breeder who still compete in Menton. The final and most anticipated decision on the show was the senior stallion championship. Even before the championship started, it was obvious the decision was between Excalibur EA and Wadee Al Shaqab. 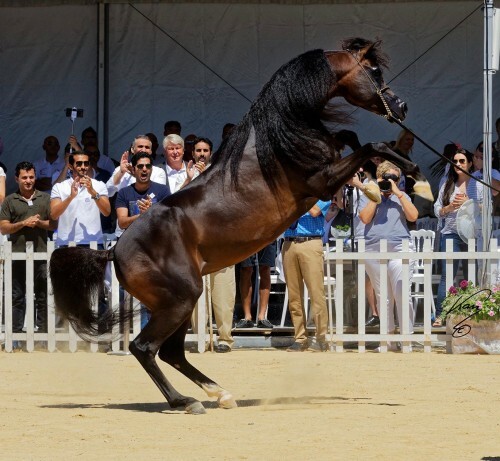 The crowd cheered for their favourite and there was a great jubilation when Wadee Al Shaqab was announced Unanimous Gold Champion Senior Stallion. An incredible bay stallion and incredibly sweet character, just, like his famous sire Marwan Al Shaqab, Wadee Al Shaqab is already a World Champion Colt and was now ready to explode and made clear, he is a worthy successor of this majestic sire line. His handler Giacomo Capacci celebrates Wadee Al Shaqab not only as a multi champion winning horse and excellent sire. Since Giacomo stayed with Wadee during a serious illness and difficult surgery, this bay stallion is extremely close to him. 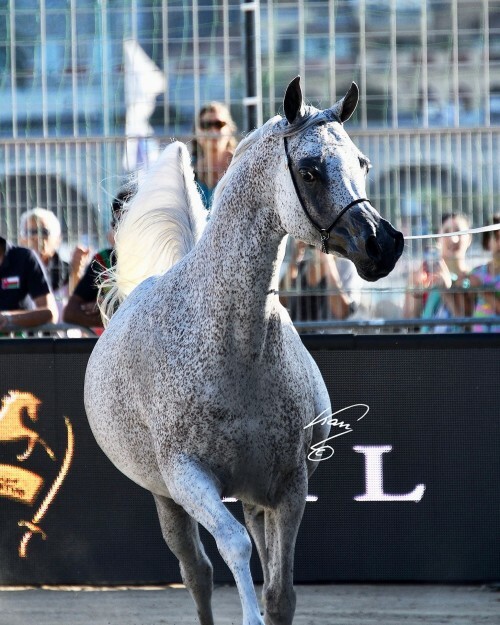 Wadee Al Shaqab is out of OFW Mishaahl by Mishaah, who untimely passed away in 2016, leaving the fantastic Kahil Al Shaqab, a full brother to Wadee Al Shaqab and a collector of prestigious titles. With flying mane and hooves Excalibur EA entered the ring and accepted Silver. Bred by Equus Arabians, Spain, and owned by Al Saqran Stud, Excalibur EA earned the elusive European Triple Crown in 2014. His sire is Shanghai EA out of Essence Of Marwan EA. Bronze went to Magnum Psyche son Van Gogh AM, bred by Sally Badeker, USA, and owned by Asayel Stud, Kuwait. The bay stallion is out of Ynazia HCF, who combines the blood of Aladdinn with Bask. It was an impressive show in a fantastic atmosphere. Of course, the competition was strong nevertheless everybody enjoyed the event. Thank you to the organizing team for arranging everything so elegant and smooth. And thank you to Aljassimya Farm for their generous support of Arabian Horse Global Network here in Menton.